BROWNSBURG, IN – December 14, 2013 – Belardi Auto Racing is eager to announce their first-filled seat in their Indy Lights Presented by Cooper Tires program for the 2014 racing season. 19-year-old, Alex Baron made his debut in the Cooper Tires USF2000 Championship Powered by Mazda in 2013 for the last two rounds at the Grand Prix of Houston and Mazda Raceway Laguna Seca. He brought home 2 wins of his 4-race breakthrough into the Mazda Road to Indy program. The aspiring driver started his racing career like most karting at the age of 6. Between 2002 and 2006 the Frenchman ran over 80 races in various classes with 38 wins and 2 French Championship titles. Through 2009 and 2010 he continued his karting career, driving for factory teams like Tony Kart France and Sodikart. 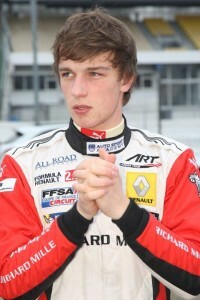 He also became a member of the FFSA French Team. In 2011, the karting sensation made the transition to cars upon taking an opportunity offered by the French Federation to test an F4 single-seater. Baron finished 1st among 7 other selected drivers, even with a new F4 track record at the Le Mans track. His performance encouraged the French Federation to help him once again, which allowed him to run the F4 Auto Sport Academy European Championship. He dominated the season to win the championship with 9 victories and 11 pole positions of the 14-race season. Baron’s championship granted him a scholarship for the 2013 season from the Auto Sport Academy towards his debut in Formula Renault 2.0, which funded 7 races of the season. With half of the racing season left, Baron was ready to make the switch to American racing. With the help of 13ème Avenue, Baron was able to test a USF2000 car for the first time. After an impressive session, he was able to run the last two events of the 2013 season. After Baron’s notable USF2000 rookie debut in 2013, he quickly advanced up the Mazda Road to Indy ladder into the Indy Lights program for the 2014 season with Belardi Auto Racing. Baron tested with his new team December 9-10 at the Chris Griffis Memorial series test at Barber Motorsports Park. He ended the test at the top of the charts in 1st, an encouraging preview for the upcoming season. The Indy Lights series will commence the season on March 30 on the 1.8-mile circuit on the streets of St. Petersburg at the annual IndyCar season-opener.